For as conscientious and proactive about the environment and resource conservation as I like to think I am there are things that happen that just make me scratch my head at what a lazy dummy I can be. Case in point: this spigot, which in the picture below you’re seeing in its deaththroes as a leaker — something it’s been for a looooong time. I’m embarrassed to say how long. A couple years– that I’ve known about it, and goodness knows how much further back beyond that. How bad a leaker? Bad, but don’t judge by that picture, it wasn’t that bad. What you’re seeing there is drainage with the valve fully out after I’d shut the water off to the entire house. In actuality, though it was still reprehensible. How much so I discovered two weeks ago when I finally began to sort of think about maybe getting around to some day doing something about fixing it. I placed the business end of the hose that’s normally attached to the spigot at the mouth of a five-gallon water bottle beneath it. While I can’t pinpoint the exact rate of flow, I can tell you that less than 45 minutes later the vessel was almost a third full. When I checked again some three hours later that morning, the bottle was full. And leaking out, of course. So you figure we were pouring out about 1.5 gallons of water every hour of every day of every week of every month of every year for the past two years, minimum: 1.5 gallons x 24 hours x 365 days x 2 years = 26,280 gallons. Stupified by such procrastitorial lunacy, four days later (or should I say 144 more gallons) I went to our local hardware store, and bought a replacement spigot (they call them “bibs”) figuring I would wrench the old one off the pipe and with some sealant wrench the new one on. Yeah, fat chance. 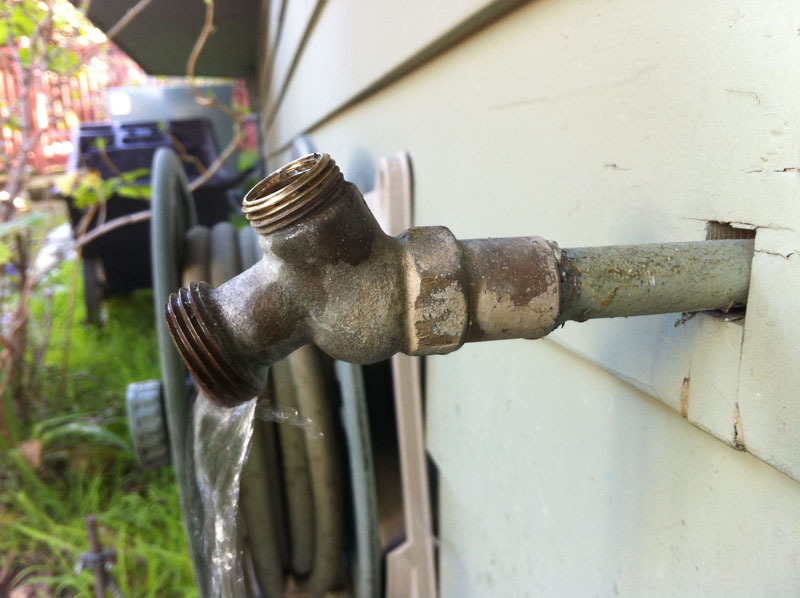 Because what I found out when I got home was that the old spigot featured a coupler/sleeve thing welded to the water pipe. Visions of plumbers danced in my head. But wait, I thought. Maybe I could replace the washer? That seemed like a good idea until I stripped the head of the screw holding the worn out gasket. Then wait again, I thought. Maybe I can just replace the entire old valve system with a new one? This past Sunday (that’s right, another 288 gallons later), I went back to Baller’s with that plan and the worker just chuckled. They don’t sell just the guts of a hose bib. You gotta buy the whole thing. I told him I’d bought one of those already (and that I’d tried unsuccessfully to loosen and unscrew the guts out of that one) but the water pipe size is smaller than the bib size. “Oh so you need to cut off the old bib at the water pipe, get a coupler and weld that on,” he counseled. Which would be great if I had a welding device and some sort of welding experience. Visions of plumbers danced in my head again. “You could always just replace the washer” he said, and I shook my head as he took the valve and attempted unsuccessfully to remove the ruined gasket screw. “Or maybe not,” he said handing it back. Then it dawned on me and I asked if he had any screws the same size handy. He did and I came away from there with a 74-cent rubber gasket and a 29-cent screw. And once home I pecked and pulled at the rotten old washer until it crumbled from around the stripped screw, then I used a pair of pliers to grip it and got it loose and out. Then I put the new gasket on with the new screw, and reinstalled the bib guts into the bib. Then I turned the water shutoff back to on and damn if the sucker’s been dry this last 36 hours (or 54 gallons). I still feel like a fool for waiting so long, but at least now I’m a proud fool. This entry was posted on Monday, January 24th, 2011 at 6:25 pm and is filed under home economics. You can follow any responses to this entry through the RSS 2.0 feed. Both comments and pings are currently closed.